Hello everyone and welcome to the crumbling of my resistance to starting a 30k Astartes army. Literally every other member of the Warbasterds has a hobby-hardon for Heresy-era gaming except for me – while I like the models that FW are releasing and the setting itself, the thought of painting more Astartes and games of purely Astartes rubbing their power-armoured manliness over each other leaves me a little cold. Or at least it did. I think my reticence was mainly due to the fact that I am currently wrapping up a 40k Astartes army and I’m a little burnt out on them in general. However, having thought about it, Blood Angels are something I wanted to do for a while and a small mid-Siege of Terra army sounds perfect – plus, it won’t be started until next year, leaving me plenty of time to get excited. 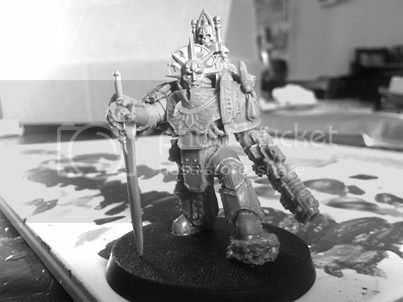 So, having a spare Praetor lying around (as you do) I knocked up this quick chap – I’ll run through the parts etc in a min, but the basic idea behind him is that he is a Sanguinary Guard who has become separated from his Primarch during the Siege of Terra and instead makes do with hunting traitor captains etc to behead them. The rest of the army are more than likely going to end up as part of the 5th Chapter, the Flesh Tearers. It was a pretty simple conversion, but I reckon it looks rather good. That wraps it up for this week, as ever we always welcome submissions via facebook, twitter or to our email.